Mona, as she appears in WarioWare Gold. This article is about the character in the WarioWare series. For the character from a Club Nintendo comic, see Mona (Club Nintendo). —Mona, WarioWare, Inc.: Mega Microgame$! Mona is a major human character in the WarioWare series. One of Wario's original employees and microgame programmer, she is also shown working part-time in many establishments of Diamond City, most owned by Joe, while competing with The Dinosaurs, a rival group. Since her introduction in WarioWare, Inc.: Mega Microgame$!, Mona has appeared in all installments of the WarioWare series except WarioWare: D.I.Y. Showcase. 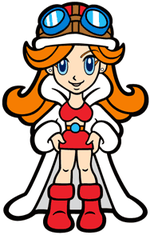 As revealed by Mona's diary at the official Japanese website for WarioWare, Inc.: Mega Microgame$!, Mona is the daughter of an artist and a supermodel. The artist is her father, while her mother is a busy supermodel who travels the world and doesn't see her daughter often. In a comment by Mona in the blog of the Japanese website for WarioWare: Smooth Moves, it is written that she empathizes with Ashley, since Ashley often feels lonely and thinks about her parents, while Mona herself rarely sees her busy mother and father. The games themselves, however, have yet to make a full mention of Mona's family. Mona is first seen in the intro of WarioWare, Inc.: Mega Microgame$!, where Wario calls her to join WarioWare, Inc. and to produce microgames for his upcoming game. As with Wario's other friends in Diamond City, Mona agrees. Mona's own story starts at the Gelateria, Mona's workplace in this game. The manager Joe, known as Gelato Joe, goes to his work and opens the roller shutter of the building at 7:53 a.m. Mona's shift begins at 8:00. Mona is in a hurry to reach her workplace. Mona, meanwhile, is on her red scooter, driving through various landscapes. At one point, Mona must stop before a large group of children passing the street. While she is waiting, she is shocked to realize that it is already 7:55. After the children pass through the street, Mona continues to hurry. She drives past a Diamond Police car, however. The police notices her speeding and chases her. To get rid of the police, Mona asks her animals for help. She presses a button on the handlebar of her scooter, and her tiny Elephant emerges and fires sludge at the police car to stop it. A new police car, however appears behind Mona. Again, the hatchway opens, and her Pig kicks a soccer ball at the car, so it must stop as well. Now, however, a whole fleet of cars of the Diamond Police chase Mona. In the last resort, Mona asks her Monkey (then known as Chimp) for help. It throws a banana peel at one car, making it slip and fall. To aim better at the police cars, the Chimp puts its hi-tech goggles on. Mona and Joe selling ice-cream at the Gelateria. Eventually, Mona can finally escape from the Diamond Police. She runs inside the Gelateria and inserts her staff card at 7:59, only two seconds from 8 o'clock. Her employer Joe is very happy that she has arrived in time. Mona then wears her uniform and starts serving gelato. Mona also makes an appearance in the ending story of the game, where Wario represents his employees in the WarioWare headquarters. Wario, however, is unwilling to share the company's profits with any of his employees. Mona calls Wario a "greedy punk", but Wario escapes. She is shocked, but unlike the other employees, she chases Wario. Wario, however, successfully escapes from the headquarters with a rocket attached to the building. In a two-player minigame, called VS Dong Dong, Mona, player 1, is controlled with , while her opponent is Dribble. A single-player minigame, Paper Plane, features Mona as one of the characters looking through a window and telling the current flight time. For WarioWare, Inc.: Mega Microgame$!, Mona creates Strange microgames. All games involve mostly everyday objects, such as brushing the teeth or plugging a finger into a nose. Mona in her yellow outfit, which can also be red, blue or green. In WarioWare, Inc.: Mega Party Game$!, Mona now works as a waitress at the Sora Sora restaurant. In the ending movie, which can be seen after beating the single-player mode, Stage Clear, she drives her scooter to her workplace and hits a soccer ball while driving. The ball flies into the headquarters of WarioWare, Inc. and hits Wario's television set making it display Mona's Elephant. At some time later, Mona in her uniform introduces Wario and the WarioWare employees at the restaurant. Mona is one of the ten selectable characters in the multiplayer games in WarioWare, Inc.: Mega Party Game$!. Her multiplayer mode minigame is Listen to the Doctor! Here, a player is instructed to do microgames as well as do other actions as a doctor says. The other players clap on how well the player has done. WarioWare, Inc.: Mega Party Game$! features Mona's strange microgames. In the intro of WarioWare: Twisted!, Mona comes with 9-Volt to Dr. Crygor's lab. There, Dr. Crygor tries to fix Wario's broken Game Boy Advance with his invention, the Gravitator, but it has no buttons after the repairing. Instead, players had to move the system to move the character in the game. Mona and 9-Volt try and enjoy it, giving Wario the idea to make a new WarioWare game involving this gameplay. In addition, Mona changes her workplace once again. Now, she is employed at Mona Pizza, a pizzeria owned by Joe, there known as Pizza Joe. Mona Pizza is a competitor to Pizza Dinosaur, a huge restaurant chain. In Mona's story, a customer mistakenly calls Pizza Dinosaur for Mona Pizza. The employees of Pizza Dinosaur, the Dinosaurs, mad, use their dinosaur machines to attack Mona, who delivers pizzas at the time. While Mona's Elephant and Pig cannot stop the machines, her Monkey threw a banana peel on the road again, flipping dinosaur machine, so Mona can deliver the pizzas safely. Mona's microgames in WarioWare: Twisted! involve a particular style of gameplay rather than a specific visual theme, which is continued for the next games in the series until WarioWare: D.I.Y.. In this game, her set of microgames is called Mini Spin and requires small spins and perfect precision. Ken the VJ announces the success of "Mona and The Hot Slices" in the show Ear Candy. In WarioWare: Touched!, Mona becomes the bassist of a rock band called "Mona and The Hot Slices" composed of herself and Art and Deco. While Mona plays the bass guitar, Deco raps and Art plays a banjo. In Ear Candy, a television show of the channel DBS, Ken the VJ announces that Mona and her sidekicks reach the top of the record charts and displace the pop singer Vanessa from the first place, who performed with the Dinosaurs as the background guitarists. He also announced that Mona has a gig at the Hawt House. After watching it, Vanessa, furious, vows to keep Mona and her friends from reaching the Hawt House. At this time, Mona, Art and Deco are doing their last music probes at Mona Pizza before their gig. When they are done, Mona drives her scooter toward the Hawt House while Art and Deco follow her in a van. While they were on their way, Vanessa and the two employees of Pizza Dinosaur appear on motorcycles to slow the trio. Then Vanessa drives toward the Hawt House while the Dinosaurs drive a bird-like vehicle and fly directly over the trio, grabbing Art. Mona calls her animal friends for help, who came in small propeller aircrafts, but they are kicked away by the bird-like machine. Even Pizza Joe arrived in a similar aircraft, but he is kicked away as well. The last helpers are 4.1 and 4.2, who fly in a spherical flying vehicle, who are able to shoot soccer balls at the Dinosaur's machine, but they eventually fail. Deco then activates an ejection seat of the van, causing the bird-like machine to release Art and fall down finally. With the machine gone, the trio hurry to the Hawt House. At the Hawt House, the fans are waiting for the appearance of the trio. "Mona and The Hot Slices" arrives and pleases the fans. Vanessa, who is also present at the Hawt House, however, is seen furious. Mona, however, realize that she must deliver pizzas, so she immediately leaves the Hawt House. While Art and Deco stop playing, Vanessa gets an idea. Garbage Boy, who appears at every performance of the band, wants to heat up the atmosphere and goes to the microphone, but he is kicked away by Vanessa. She tries to disguise herself with a wig and a hat similar to Mona's, but the people boo and throw various objects at her. In WarioWare: Touched!, Mona's set of microgames is called Cute Cuts and involves slicing with the Stylus. For example, in the Steel Chef microgame, the player must slice flying food two or more times to win. Mona as the captain of the Diamond City Roughs cheerleaders (also called the Monettes). 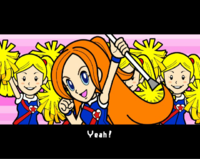 In WarioWare: Smooth Moves, Mona works as a cheerleader. She drives her scooter to the football stadium of Diamond City, but she is late again, so she drives directly into the stadium. There, she is the leader of the Monettes for the Diamond City Roughs, who plays against Team Dinosaur, a football team that, at the least, is inspired by Pizza Dinosaur. One of the players of the Diamond City Roughs has fallen in love with Mona and keeps her in mind, but he tries to focus on the football game. The game is announced by Ken the Reporter and Joe. When only a few seconds of the game are left, the player who loved Mona gets the football and has to pass three members of Team Dinosaur. The thought of Mona gives him the motivation to hit the Dinosaurs away and to make a touchdown. At the end, the Roughs wins the game. After the game, the player wants to confess Mona his love, but he stutters, and when he is done, Mona has driven away. Instead of Mona, he says it to one of the other cheerleaders, shocking her. Mona appears in the story of Young Cricket and Master Mantis, where she serves dumplings along with Joe. Mona's animals and Art and Deco also help. Mona's Bear also makes his first appearance, although it is a brief one. She also writes the last town bulletin board message, which is obtained after collecting all Pose Cards. Mona works as an editor of Wario's one-shot newspaper "The Weekly Wario" as well. There, she describes herself as a Form Baton expert. In WarioWare: Smooth Moves, Mona's set of microgames involves the forms The Remote Control, The Handlebar, and The Umbrella. The Japanese WarioWare: Smooth Moves website features a blog section for the WarioWare developers. In her blog entry, Mona describes various establishments of Diamond City and explains she frequently changes jobs because her boss himself frequently changes business. On Ashley's blog entry, Red explains that Ashley feels lonely as she misses her parents, who live in her distant hometown. In the comments, Mona states that she empathizes with Ashley as she too rarely sees her parents, and offers Ashley to come see her if she ever needs comforting. Ashley simply responds "Everyone... I hate you." In WarioWare: Snapped!, Mona runs the newly-opened Wario Park along with Wario, Jimmy T., Kat and Ana. In Mona's five microgames in WarioWare: Snapped!, the player has to line up with objects on the screen. She adds stylish decorations to the photos taken of the player after the end of her stage. In WarioWare: D.I.Y., Mona and Joe, the latter one acting as a cameraman, explore an ancient building, which they find after a trip through the jungle. Mona, holding the microphone, reports on their adventure on the show Mona Tankentai (translate as "Mona Exploration Team"). The theme of Mona's microgame set is Strange, like her first appearance. Mona, along with Jimmy T., 9-Volt, Orbulon and Ashley, apparently leave WarioWare Inc. to work for Diamond Software in this game. Various residents of Diamond City consider the D.I.Y. Forums feature of the game, as well as Wario's taking all credit for making games, the most probable cause for leaving. Later games such as Game & Wario though, shows that she and everyone else have returned to working at Wario's company. Screenshot of Mona from Game & Wario. In Game & Wario, Mona works at the Diamond City Times as a photojournalist, taking pictures of criminals at the scene of a crime. She is featured in the minigame "Shutter" which involves taking images of the hidden criminals from the buildings and streets. Mona is featured as the subject of several Cluck-A-Pop capsules, collectively named Mona Superscoop. These capsules feature Mona sharing various information about life in Diamond City and its residents. She is also featured in the "Beauty Magazine" capsule. In it, Mona takes a photo of the player's face, which then has various comical filters applied. Mona, along with most other characters in the game, also appears in the Bowling minigame depicted on a bowling pin. As with the other WarioWare characters, Mona makes an appearance in Miiverse Sketch Masterpiece Collection, a series of video showcasing pictures of often questionable quality made in the game's Miiverse Sketch mode. Mona is the host of the twelfth video, themed after drawings of Tutankhamun. Mona makes a reappearance in WarioWare Gold for Nintendo 3DS. She hosts the second set of the Mash League. Mona's story begins with her going to Joe's Clothes to get a dress for a party. After Joe asks her what her perfect dress would be, she decides she needs a dress "that's extravagant like a parfait, cute like a plushie, and super cool like Wario" as she considers him to be a "fashion icon". She then tries out the dresses in the store as a deeply confused Joe watches on. Once she finishes, Mona packs up her new dress and asks Joe to come to her party, to which Joe reluctantly accepts. However, Mona realizes she is late to her own party, and takes off on her motorcycle, hastily leaving Joe behind as he can only watch in embarrassment. During the Dancing Team set of the Ultra League, Mona arrives with Dr. Crygor, Jimmy T., Mike, Fronk, Young Cricket and Master Mantis, Kat and Ana, and Penny, where they assist Manager Joe in filling up his new nightclub, Club Joe. She is seen dancing with the rest of the group, and notices that they are missing Wario. Mona stars in the gag strip Waiwai! Wario. The comic starts with Mona finding Wario asleep, which horrifies her as he had promised to take Mona to her live concert. She wakes up Wario, who keeps making excuses as to why he can't go. Mona summons the other WarioWare employees to wake Wario up, almost succeeding in getting him to keep his promise after Ashley stabs him with a voodoo doll. Wario, however, immediately desists when Mona points out there is heavy rain outside, causing both of them to be late to the concert. Mona has two stickers that can be equipped in Super Smash Bros. Brawl's Adventure mode; one increases indirect special attacks by eight, and the other increases slash resistance by four. Additionally, one of the names that can be gotten from pressing the "RANDOM NAME" button is "MONA". Mona from Game & Wario is depicted as a WarioWare series trophy in Super Smash Bros. for Wii U. The trophy can be purchased from the Trophy Shop. Mona appears as an Ace-class support spirit in Super Smash Bros. Ultimate. When equipped on a fighter, it increases damage done by down special moves. Her spirit can only be summoned from the cores of the Ayumi Tachibana and Ouendan Cheerleaders spirits. The Reporter dressed as Mona in the "Wario... Where?" set. Mona makes several appearances in the "Wario... Where?" challenge set of Rhythm Heaven Megamix (inspired by the WarioWare installments). She first appears in Dr. Crygor's version of Freeze Frame, where she is part of the crowd that blocks the player's view of the background near the end of the minigame. Her scooter is also seen in Kat & Ana's remake of Catchy Tune 2. Mona later appears in the final game of the set, Ringside. The Wario... Where? version features The Reporter dressed as Mona interviewing The Wrestler (disguised as Wario Man). Mona herself appears next to the building in the game's intro and outro. Mona makes a cameo as a background sign in Paper Airplane Chase, appearing after the player reaches 90 points in Endless Mode. Her appearance is based on her WarioWare: Smooth Moves design. Mona in her debut appearance. Mona is a teenage girl attending high school. She has a rather fair skin complexion and long orange hair, although her hair appears to be shorter in Game & Wario. Mona's hair often has two bangs over her face, although in later appearances, a third one was added. In the majority of her appearances, Mona has blue eyes with orange eyelashes. In Game & Wario however, she has solid black eyes. She is also seen wearing some form of headgear in almost every one of her appearances. She is also shown to wear makeup from time to time. Unlike most characters, Mona's outfit has changed in every one of her appearances. However, Mona's general design appears to resemble that of biker gear, what with her attire consisting of a white mink fur coat, a red sports bra, a red mini-skirt being held up by a brown belt with a blue buckle, and red boots. When working, she wears more formal attire. In WarioWare: Twisted! (In which she works as a pizza delivery girl), she wears a yellow tank top, a blue and yellow baseball cap, and blue rollerskates. An alternate version of her artwork in WarioWare: Twisted! depicts her wearing a similar outfit, but all traces of blue and yellow in her outfit are replaced with red and white accents. 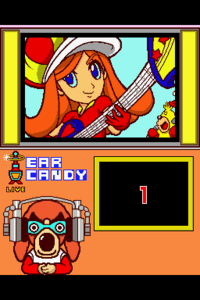 In WarioWare: Touched!, Mona (depicted as a bass guitar player) wears a red dress, red gloves, and a large striped hat with sewn eyes. The bass she plays is yellow and green with heart and star motifs. 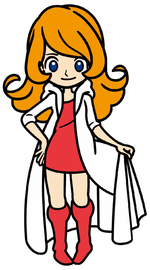 WarioWare: Smooth Moves depicts Mona as slightly taller and older with even more of a slim build than before, wearing formal cheerleading attire. She also appears to be wearing a bit of makeup, as seen in her official artwork for the game. It is this more mature look that seems to have stuck with Mona for every game starting with WarioWare: Smooth Moves, with the exception of Game & Wario. In WarioWare: Snapped!, being a park employee, Mona wears a white and green uniform with a headphone and a small hat. Mona takes up the job of an explorer in WarioWare: D.I.Y., where her outfit is mostly pink. Mona is also depicted with small earrings and a little bit of makeup, similar to her first appearance. In Game & Wario, Mona is a photographer, and she has a circular face shape, has shorter hair, and appears slightly younger than her previous appearances. This design is later used in Rhythm Heaven Megamix. In her opening cutscene, she wears makeup. With the new artstyle introduced in WarioWare Gold, Mona's appearance in the aforementioned game appears to combine elements of her general design (long orange hair, blue eyes, slim build, tall frame) with the more simplistic design used in Game & Wario (circular face shape, less makeup, slightly younger look overall). In this game, Mona wears a less voluminous version of her usual white mink fur coat. Also, rather than the usual red sports bra and mini-skirt that normally come with said fur coat, Mona instead wears a red dress. When riding her scooter, Mona now wears a red helmet rather the brown one seen in previous games. Mona has a tomboy-like personality, as she is said to be spunky. Mona is often willing to help, but she is often willing to speak out aggressively if her employer is being unfair. She called Wario a "greedy punk" after realizing that he received all the credit for the microgrames, and when Wario attempted to escape, she was the only employee that pursued him. Although she likes Wario and even looks up to him, she also appreciates it if she is paid adequately, often expressing her want for a raise or a pay check. Mona is also dedicated to her jobs and school; if she is late, she does everything it takes to be on time, even if it means breaking the law and avoiding the police. She seems to like Wario, even to having a crush on him. She also seems to be friendly with 9-Volt. Despite her upbeat personality, according the official Japanese website for WarioWare, Inc.: Mega Microgame$! and WarioWare: Smooth Moves, Mona often feels lonely without her mother, who is often out in trips. She is also revealed to be empathetic toward Ashley, who also misses her parents. As seen in all games of the WarioWare series, Mona owns some different small animals. They often help her against her pursuers. All animals wear a shirt with a number on it. Mona's Elephant (No. 1): A tiny, walking blue elephant. It is able to shoot sludge and soccer balls from its trunk. Mona's Pig (No. 2): A walking pig. It can kick soccer balls. Mona's Monkey (No. 3): A brown monkey wearing hi-tech goggles. Mona's Monkey throws banana peels, and its goggles allow it to aim better. 4.1 and 4.2: Their species are not identifiable, but they are brown and have pointed ears and whiskers. They are able to speak as well. They can control a spherical vehicle shooting soccer balls. Mona's Bear (No. 5): This small gray bear made only a brief appearance in WarioWare: Smooth Moves. Hey, you're a new face around here! Well, I'm Mona! I scoop gelato at the gelataria-when I'm not at school or making games, that is. So anyway, you should know that fortune-hunter Wario has inspired many of my strange games! He's always one degree ahead of cool, and he's even let me tag along with him on some of his money-grubbing adventures! Bio: This peppy high-school girl keeps up with schoolwork, a part-time job at the restaurant, and her red scooter. For some reason, she's a little smitten with Wario. Ew. Whether it's delivering pizzas, crooning hit singles or fighting off jealous rivals in an airplane that looks like a giant chicken, this go-to girl never loses her spunky spirit. Now, just what should she wear today? "Hey, I'm back! I may work as a pizza-delivery diva by day, but I also play the bass in the hardest-rockin' band in the city – Mona and THE PORK LOINS! Our first gig is today at the famous HAWT HOUSE! Come check us out... we're going to, like, totally ROCK!" "My CUTE CUTS are easy to play: just make quick slices across the screen. Simple, right? It's a lot like jamming on a bass!" Rank C – She's bright. She's zippy. She's Mona! This high-school student also makes time for her friends. And shopping! Rank B – Mona adores cute little critters. Sure, cats and dogs. But it's fuzzy-wuzzy caterpillars that really win her over! Rank A – Mona wants to be a famous adventurer. That must explain why she admires Wario—his nose for treasure! DS WarioWare: Touched! (02/2005) Normally she's an ordinary high schooler from Diamond City, but in Game & Wario, Mona is a roving photographer eager for the big scoop! In the solo game Shutter, you scour the city on the TV screen for your targets and then use the Wii U GamePad to snap pics of them! Get the perfect shot to make the front page of the papers! Normally, she's an ordinary high-schooler from Diamond City, but in Game & Wario, Mona is a roving photographer eager for a scoop! In the solo game CAMERA, you scour the city on the TV screen for your targets, then use the Wii U GamePad to snap pics of them! Get the perfect shot and make the front page of the papers! For this subject's image gallery, see Gallery:Mona. "I'll be glad to teach you! Umm, by the way... you'll pay me, right?" - WarioWare, Inc.: Mega Microgame$! "You greedy punk!" - WarioWare, Inc.: Mega Microgame$! "Hey! Hurry up!" - WarioWare, Inc.: Mega Microgame$! "Yeah!" - WarioWare, Inc.: Mega Microgame$! "Cool!" - WarioWare, Inc.: Mega Microgame$! "Go!" - WarioWare, Inc.: Mega Microgame$! "Bye!" - WarioWare, Inc.: Mega Microgame$! "Nice monkey!" - WarioWare, Inc.: Mega Microgame$! "Oh, yay!" - WarioWare, Inc.: Mega Microgame$! "See ya!" - WarioWare, Inc.: Mega Microgame$! "Right on!" - WarioWare, Inc.: Mega Microgame$! "Awesome!" - WarioWare, Inc.: Mega Microgame$! "Oh, no!" - WarioWare, Inc.: Mega Microgame$! "Thanks for calling Mona Pizza! Three Mona Specials? Sure thing!" - WarioWare: Twisted! "Hello! Wario’s busy, so I’m going to brief you on how to play! You know, my plate is pretty full with my pizza shop, music, and WarioWare, Inc. And he thinks he’s busy! I’d better get a raise for this!" - WarioWare: Twisted! "It’s Wario’s game, so you’ll start on his stage. Spin the GBA until the hand is on his ugly mug (I hope he’s not reading this!)" - WarioWare: Twisted! "Welcome to Mona Pizza! I’m working my part-time job at the pizza joint today! The manager says pizzas need to be served hot, so I brought my roller skates from home! I dunno, it made sense at the time" - WarioWare: Twisted! "You’ve gotta use cute little moves on my cute little games." - WarioWare: Twisted! "Come check us out... we're going to, like, totally ROCK!" - WarioWare: Touched! "Wario got a little overexcited and had to take a breather! It's a good thing, too-he has the tendency to spray it and not say it!, I'm taking over from here!" - WarioWare: Touched! "Heya! It's me, Mona!" - WarioWare: Touched! "Oh no, I totally forgot! I've got pizzas to deliver!" - WarioWare: Touched! [on a drawing of a staring face] 視線がコワイなあ…。 "The gaze is SCARY..."
[on a drawing of a waving person]ずいぶん気さくね！"Very friendly, ne~!" [on a drawing of a face with "tsutan" written next to it] 「ツタンでーす！」 " ‘I am Tsutan(Tut)!’ "
[on a drawing of a face with "kāmen" written under it]「カーメンでーす！」って漫才師か！"‘I am Kāmen!’ he says... are they a manzai duo?" [on a drawing of a sideways fish-looking sarcophagus] 棺と顔が一体化しちゃったのね。 "The coffin and the face have been interrogated together, yeah?" [on a drawing of a large face] 笑いをこらてるでしょ。 "This has to endure being laughed at." Mona was the first WarioWare developer to appear in 3D, after Wario himself. 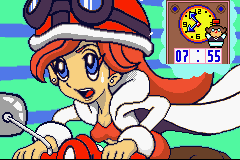 In the movie "Shiner Diner" in WarioWare, Inc.: Mega Party Game$!, Mona can be seen driving her scooter partly in 3D. In WarioWare, Inc.: Mega Microgame$! one of Mona's outfits depicts her wearing Wario's standard plumber attire during the intermission between her microgames. Additionally, in WarioWare: Touched!, she can be seen again, wearing Wario's Biker outfit, except with a few minor alterations, such as her pink skirt replacing Wario's pink pants, and lack of a helmet. In WarioWare, Inc.: Mega Party Game$!, Mona's theme melody is based on the music that can be heard while visiting Princess Shokora's item shop in Wario Land 4. The music can also be heard in WarioWare, Inc.: Mega Microgame$! in a less modified form when the Gelateria is seen from inside during Mona's story. Mona can be seen with a few of her previous game outfits in her character trailer for WarioWare Gold. ↑ NintendoRU. (September 27, 2018). WarioWare Gold — трейлер Моны (Nintendo 3DS). Retrieved September 27, 2018. This page was last edited on April 21, 2019, at 20:21.